As one would expect, Lake Tahoe parks are quite numerous. Some of the more obvious parks and recreation areas that travelers will encounter while driving around the lake include D.L. Bliss State Park, Emerald Bay State Park, Sugar Pine Point State Park, Burton Creek State Park, Kings Beach State Recreation Area, and Lake Tahoe Nevada State Park. They are all pretty much right on the lake. Burton Creek is primarily a hiking and cross country skiing recreational area. The Kings Beach State Recreation Area is primarily a lakefront park popular with visitors engaged in water related activities. Both D.L. 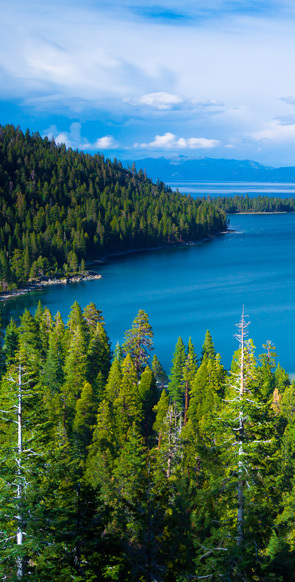 Bliss and Emerald Bay are great places for camping with walking trails to spectacular views. If you're into scuba diving, Emerald Bay has a terrifically exciting underwater barge and boat graveyard that is becoming increasingly popular. There are many other parks and recreation areas in the Lake Tahoe region, most notably, Desolation Wilderness, the Eldorado and Tahoe National Forests, the Mt. Rose Wilderness Area, and Washoe Meadows State Park. The Pacific Crest Trail (PCT) passes through both the Eldorado and Tahoe national forests. The Mt. Rose Wilderness Area includes much of the Carson Range's high country. The Reno city limits are close to this area and it is easily accessible from the city. This, no doubt, accounts for the heavy trail usage. Between 100 and 200 hikers a day can be found on the Mt. Rose Trail. Wildlife is plentiful, including mule deer, bobcats, black bears, grouse, and mountain quail. A number of hiking trails in the Desolation Wilderness beckon. Hikers seeking a moderately strenuous day of adventure will find Meeks Bay Trail quite scenic. Those seeking awesome beauty you have to pay for in sweat will find the Mount Tallac Trail challenging. Other trails in and around the Desolation Wilderness are Bayview, Eagle Falls, and Glen Alpine. The first is difficult and the others are moderate up to a point beyond which they too become more challenging.